Katrina Marklevits of the U.S. Fish & Wildlife Service treats Key deer with anti-parasitic medicine to protect them from screwworm. Signs all over Big Pine Key warn against feeding Key deer. Feeding them encourages them to hang around people — and roadways. To be fair, wildlife officials say there’s a difference between feeding the deer and treating them. But it still feels weird to volunteers like Erin Elliot. "Yes, it was a little bit strange, feeding a deer in front of a ranger," Elliot said. "But, you know, it's the best thing for them." Elliot is one of about 170 volunteers who’ve been trained to lure the deer close with carrots and apples — then give them bread soaked with medicine. That’s to protect them from the screwworm infestation that’s killed at least 10 percent of the herd since the summer. 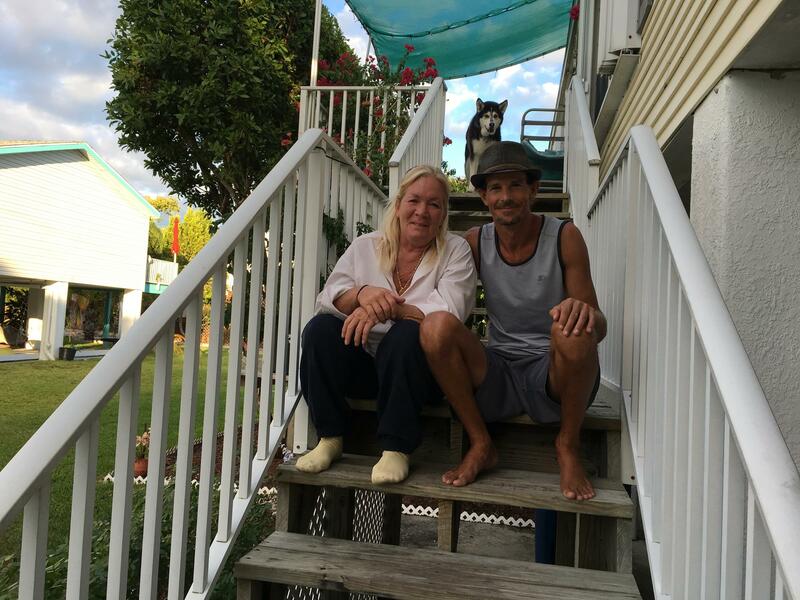 Mary Woodrum and Frank Cortese recognize the deer that visit their neighborhood on Big Pine Key. "We know our bucks. We know our grandmas. This is grandma right here," Woodrum said, pointing at a doe walking near her house. "We know our little bucks, the ones with the injuries. We know our little bucks with the weird horns. We know them all." And they’ve noticed that lately a lot fewer are coming around, especially male deer. They are more likely to have screwworm infestations because fall is rutting season when the bucks are fighting each other for dominance and causing injuries where the screwworm flies can lay their eggs. "A couple months ago, we would see like 12, 15, as many as 19 pretty much every night," Cortese said. "But we don't see any of those anymore." Mary Woodrum and Frank Cortese recognize the deer that hang around their neighborhood on Big Pine Key, and have names for some of them. Like a lot of Big Pine residents, Woodrum and Cortese feel protective about the deer. "They're like our pets," Cortese said. They’re still wild animals, though. All over Big Pine Key are signs warning people against feeding the deer. Feeding them makes them associate people with food. And that can lead to deer hanging around near roadways. Before screwworm, getting hit by a car was the leading cause of death for Key deer. 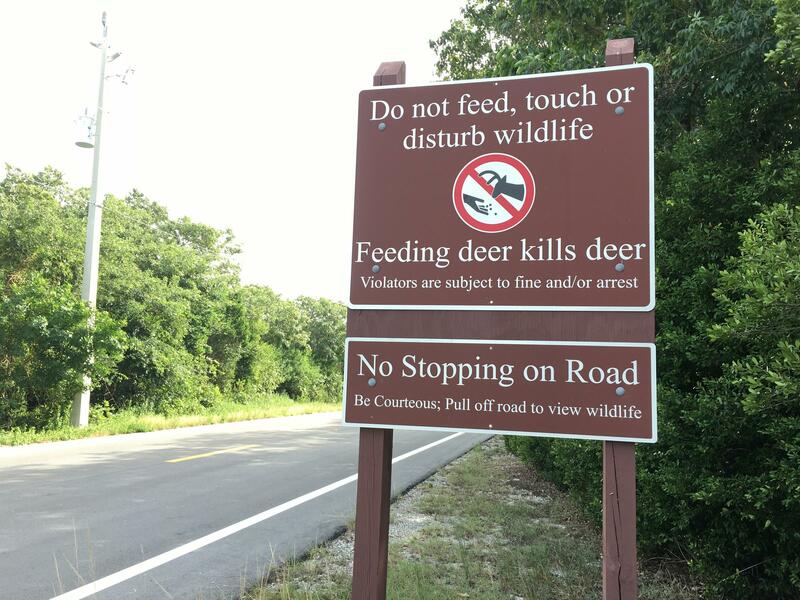 "We're still fully supportive of our message about not feeding the Key deer," said Kevin Lowry, public information officer for the National Key Deer Refuge. "We're letting them know that it's OK to treat them with this medicine, because this is a crisis and we have to consider all different types of methods of making sure the individual deer get treated with this medicine. Lowry said some Key deer, which the refuge calls the urban part of the herd, are tame — not scared of humans. "They're already approaching vehicles and approaching people in their neighborhoods," he said. So the refuge biologists are taking advantage of that to help treat the deer. For the deer that aren’t so comfortable with people, veterinarians are out in the woods finding deer with mild screwworm infections and tranquilizing them so the wounds can be treated. They've also set up self-medicating stations that use rollers on the side to apply medication to the deers' necks when they bend down to get the feed inside. 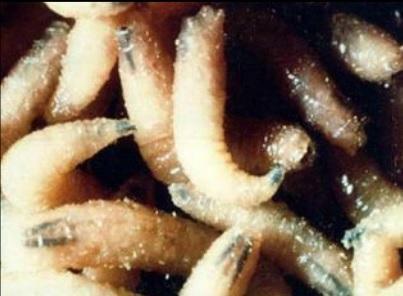 Screwworm flies will lay their eggs in an open wound on any warm-blooded animal. Doug Mader is a veterinarian who lives on Big Pine. He often helps with injured Key deer and when they started showing up with unusually large wounds, he got a call from the U.S. Fish & Wildlife Service. "And then a little light bulb went off because I had seen some similar wounds in dogs and cats," Mader said. "I went back to work and checked my computer records back there and realized that we're probably dealing with something sinister." Tests confirmed that the maggots inside those wounds were screwworm – the first infestation in the U.S. in more than 30 years. So far, 130 Key deer have died from screwworm. Most of them were euthanized. "It's pretty sad, because by the time we see them oftentimes they're pretty severely affected," Mader said. "Because they're not domestic pets. And so we don't usually see them when they're first injured, or they're first sore." Mader says he’s been getting a lot of calls from snowbirds returning to the Keys for the season. They’re worried about whether it’s safe to bring their pets. He says it is. "If you check your pet twice a day, if you see anything that's unusual, get it to your veterinarian immediately, you're not going to have a problem," he said. "It's 100 percent fixable." The Florida Department of Agriculture has declared an animal quarantine in most of the Keys to stop screwworm from spreading to the mainland. There’s a mandatory checkpoint for animals in Key Largo, on the way out of the Keys. More than 3,500 animals have been examined at the checkpoint. The vast majority were dogs. But the checkpoint has also seen chickens, cats, horses, parrots, rabbits and raccoons. Plus one ape, one snake and one rodent. So far, none have showed signs of screwworm. The State of Florida has budgeted about 12 million dollars to help Miami-Dade County in its efforts to battle Zika and the Aedes aegypti mosquito. Now, Florida's Surgeon General is requesting a comprehensive Zika action plan from the county to detail spending. Mayor Gimenez says he will comply. Does this signify a rift between the state and the county? WLRN's Sammy Mack and The Miami Herald's Daniel Chang fill us in on the latest.